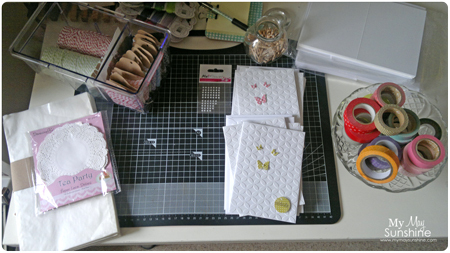 On my desk this week are things that I am going to use to package up a couple of card sets that I have made, maybe for Christmas presents. 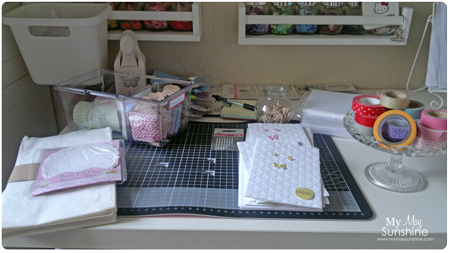 I love to make card sets up in advance as they make great gifts to have on hand. So, I have my cake stand full of washi tape. Washi tape is so easy to get hold of now and I tend to buy mine from Ebay as they have so many different colours and styles. Also from Ebay I buy the glassine bags in different sizes to package items up in. Also I have my box of bakers twine. I use a Ikea Krus container to store the twine. I only have 2 big spools which fit on one side and then all the smaller amounts of twine in different colours are wrapped around tags to store them, in the other side. 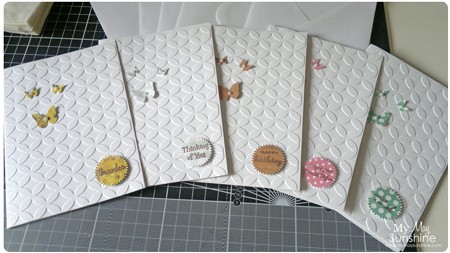 The card sets are all the same design but are different patterned paper and sentiments. 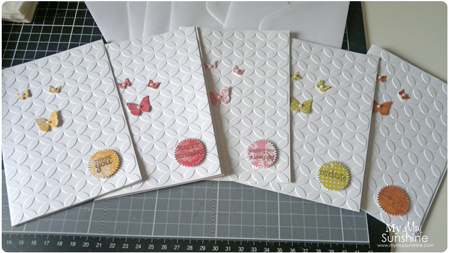 I love this embossing folder, by Cart Us – trendy circles, for the background as it fills out the space well and then I just added some simple Martha Stewart butterflies with some pearls from MEI flower and a sentiment. I just went through my stamps to find a range of different sentiments to make every card different. So that’s what on my desk today and I am planning to get them packaged up and make some tags to go on the front. I am sure that I will show the finished result soon. Linking up to Stamping Ground.